​A main feature of the Uni-dec is the perimeter extrusion. Within this extrusion we have designed the bottom profile to mate with the readily available strut channel hardware. 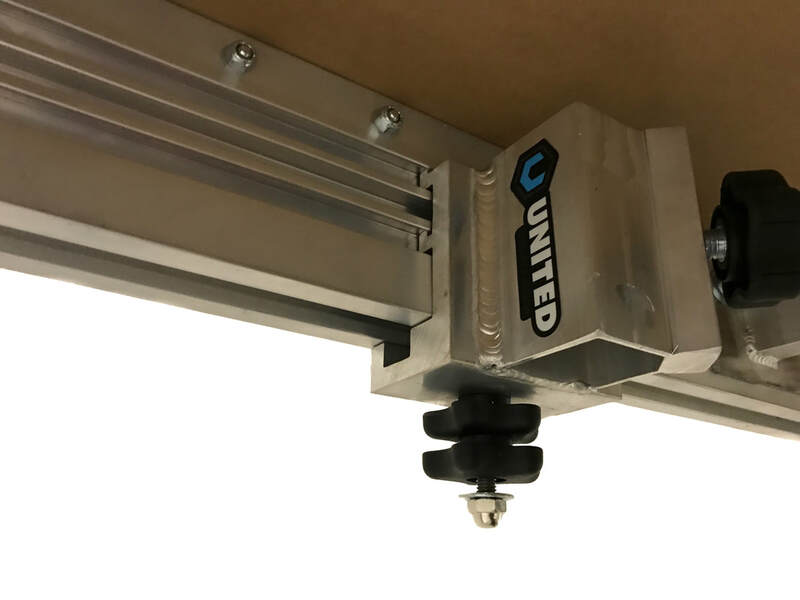 This allows for the connection of Half-boro clamps and anything else you can dream up to mount directly to the bottom rail of the stage deck with just a strut channel nut. In addition, we have designed in channels along the exterior and interior face of the side rail. 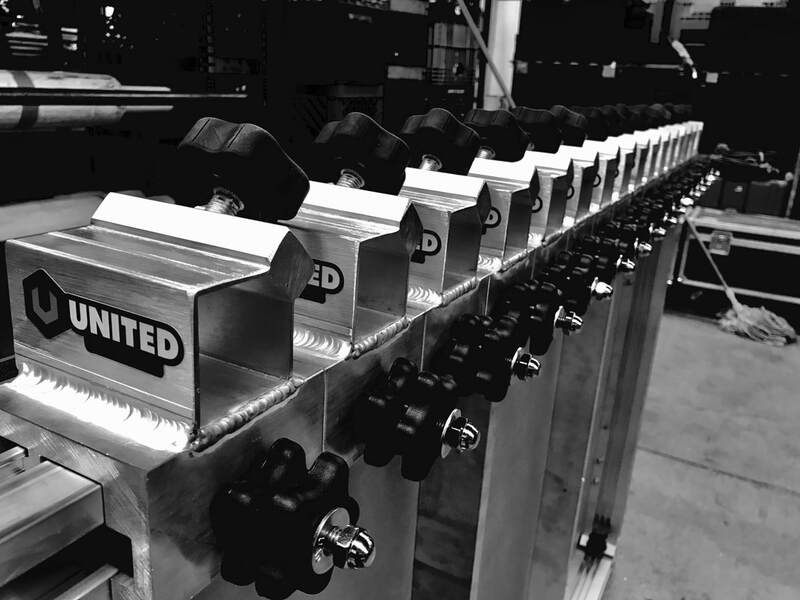 These channels are complimented by our 603 & 703 mating extrusions. The mating extrusions allows for as many options as you can imagine. We have used these extrusions as the base of our hand rail clamp, caster attachments, vertical pipe attachments, (which can be used to support video product), Joist hangers as well as customizable brackets for any array of scenic solutions. We are committed to continually developing new, improved and efficient ways of using modular stage decking. 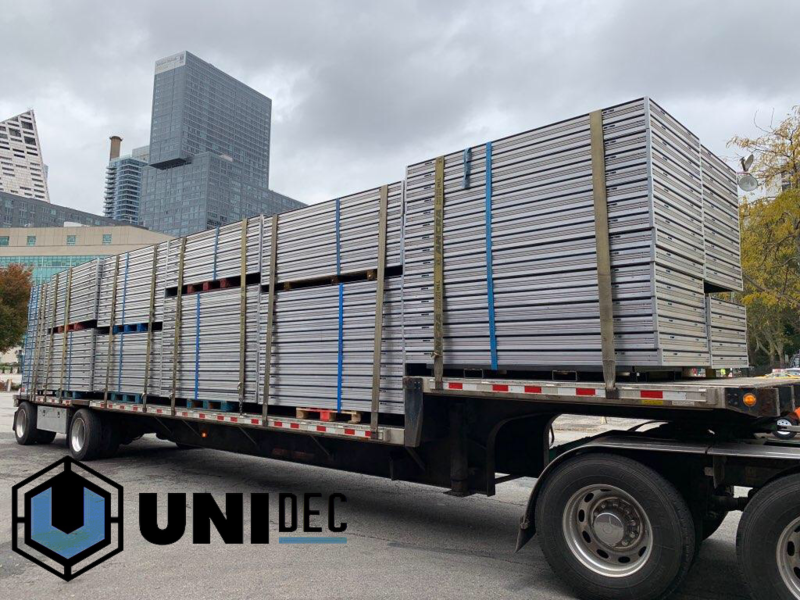 We designed Uni-dec to shipped efficiently with the possibility of 228 decks on a single trailer. Deck tested to 25,000lbs - DON'T DO THIS! Transom tested to 26,136 lbs - DON'T DO THIS! Why not show a little patriotism. The Uni-dec was designed, engineered and built right here in the USA. Made from American Aluminum and extruded the North East. We're not just a staging company. We're a company made up of motivated individuals who are looking to make an impact on the live event Industry through design, execution and service. With over 30 years in business we have staged almost every type of event. Call us today to discuss what options we have on hand for your particular show. From Presidential Inaugurations to Emmy winning Stage designs. Our Production Rigging Team can flawlessly support your design. Supporting massive video walls, Audio arrays, signage and entrance structures. Let us bring your design to reality.